Adelaide’s mother, “gay and thoughtless,” had been dead two years by the time her daughter’s story appeared in La Belle Assemblée. The gel’s guardians had placed her with “good aunt Charlton,” apparently hoping this lady and her dull, dutiful daughter would exercise some moderation upon the teenaged orphan. 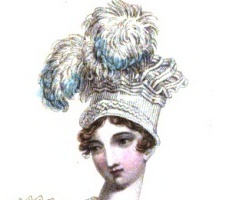 This toque is designed in the Pavilion style (note the plumes) and forms part of an evening dress ensemble, appearing in the October, 1817 edition La Belle Assemblée; or, Bell’s court and fashionable … N.S. 15-16 (1817). Alas, the damage had already been done. Adelaide’s parents were married when the bride was scarcely more than a girl herself. When Papa died, Daughter became Mamma’s bosom companion. Wherever the widow went, Adelaide was with her, whether riding in Hyde Park or driving their handsome curricle. Innocent enough, perhaps, but for Mamma’s predilection for late-night parties. After attending one crowded soiree on a “humid” December night, they both fell ill and the girl nearly died alongside her mother. These circumstances are related in the fourth of Maria’s letters to Lucy, her sister in the country. Ostensibly to describe fashion in a clever and engaging way, these “letters” in the Magazine’s Cabinet of Taste also express the Regency’s preoccupation with character, and more particularly the formation of it. It is never the done thing to dress without regard for one’s age and status. Worse, to treat a child as an adult has a most unhappy effect. Today, millions of dollars are spent studying the problem. This entry was posted in Regency, Uncategorized and tagged consumption, Pavilion Toque by Angelyn. Bookmark the permalink. Very interesting post, Angelyn. I actually feel bad for Adelaide’s mother. She sounds far too young to have had children. No wonder she used such poor judgment! She was a child herself. Makes me wonder how old the husband was when they married. Maria does not say how old the gel’s father was when he married her mother. The impression is he had little say in Adelaide’s upbringing. All part of character development–so they tell me in writers’ workshops!